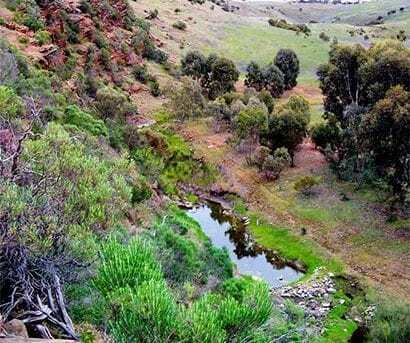 Lavender Federation Trail is a 212km, grade 3 One way hike located in Mount Lofty Ranges South Australia. The hike should take approximately 7 days to complete. The Lavender Federation Trail is a linear walking trail of 212 kilometres through diverse countryside traversing the eastern flanks of the Mt Lofty Ranges. The trail begins at Murray Bridge and takes a serpentine course to Eudunda through the Barossa Valley. The newest section from Truro to Eudunda was officially opened in 2014. A series of spur and loop tracks connect the main trail to nearby towns and access points. The Trail commences on the banks of the Murray River at Sturt Reserve, Murray Bridge. Alternative trail access points and suggested walk sections are are shown on the detailed maps, view map retailers.